Welcome to the Erie-O Motel and Marina! The Erie-O Motel is located on a picturesque waterfront location in the small lakeside town of Erieau Ontario. At the Erie-O Motel, we offer numerous facilities such as a private marina, rental cottage suites, motel suites, vacation trailer lots and a relaxing and inviting environment which is a perfect place to call home while you enjoy the year-round attractions and activities that the local area offers. 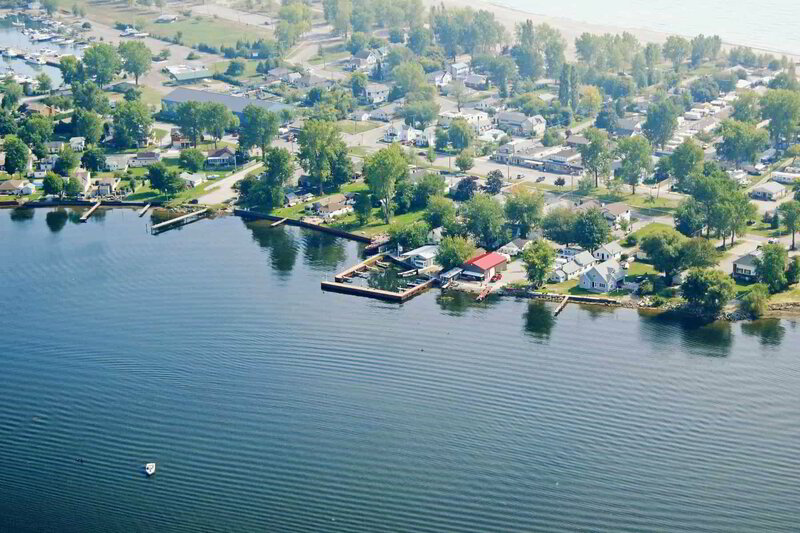 Erieau enjoys a unique location being nestled on a tiny peninsula situated between Lake Erie and Rondeau Bay. Erieau was discovered by European settlers in the 1600's when it was formed by six small islands which over the years became the unique peninsula that we know today. With a view of the bay and Rondeau Provincial Park, we know that your stay at the Erie-O Motel and Marina will be an enjoyable and memorable one. Enjoy our clean, comfortable motel room suites where you will have WiFi, Satellite TV, clean linens and smoke alarms as standard. 5 of our motel suites have full kitchen facilities. Our comfortable cottage suites have full kitchens, separate bedrooms, couches, WiFi, Satellite TV, clean linens and smoke alarms. Boaters will love our private marina where we have a boat ramp available for use. We have public washrooms and showers that our marina users are welcome to use. We also have fish cleaning facilities available. We have private designated trailer lots for 7 individual travel trailers, all featuring sewage and hydro hookup facilities to make our trailer guests stay a comfortable one. At the Erie-O Motel we aim to provide our guests with a clean, comfortable and charming place to stay and enjoy all the attractions that the area has to offer all year round. The recently renovated motel allows us to offer all the amenities of home and much more. Our clean and spacious suites come with Wi-Fi, satellite TV, comfy beds, clean linens, bathroom towels, secure parking, key entry, AC/heat, and smoke alarms. Our guest accommodation consists of 7 motel room suites, 5 of which offer full kitchens. We also have 3 unique cottage rentals suites situated directly on Rondeau Bay. All the cottage suites have full kitchens, separate bedroom and bathroom, a couch, chairs and dining table. Enjoy a private outdoor dining area at one of our cottage suites equipped with a large wooden deck. All of our guests are welcome to share our “Peggy’s Cove” common area down along Rondeau Bay. Grill your dinner on one of the BBQ’s, relax in the evening around a bonfire, fish off the docks, or enjoy a drink on the edge of the Bay. The Erie-O Motel is not just a motel, it is also our home. We hope you enjoy your stay and discover all that Erieau has to offer. Enjoy outdoor cooking and dining with our guest BBQ facilities. Relax outdoors and enjoy a natural fire in the evening around out guest firepits. For your enjoyment we have equipped all of our suites with Shaw Satellite TV systems. All guests and visitors have access to ample safe and secure parking facilities. Our suites all have their own entrances and our guests all have their own keys. Rest assured that your suite is protected by smoke alarm systems to give you peace of mind while you sleep. We have public washrooms and showers available to our marina guests and visitors. We have laundry facilities available for our guests convenience. Get out on the road and feel your stress melt away as you find yourself captivated by beautiful Village of Erieau Ontario. A quick hop off the 401 will lead you down	winding roads with plenty to discover. From Bayside to Lakeside, Erieau is a little gem of a town surrounded by water. With beaches, eateries, cottages, campsites, parks and trails. Once in Erieau, your children will love the playground, sand and water at the Erieau Public Beach. Anglers will love Erieau, with its incredible fishing and boating facilities. There are many places that you can enjoy your fishing from and you can get all of your bait, lures and fishing supplies right here in Erieau from one of the local stores. In the winter every fishing fan can try the ice fishing on Lake Erie and Rondeau Bay. You can access both the Rondeau Bay and Lake Erie from right here at the Erie-O Motel or from the Erieau Marina. Also, check out the Erieau Yacht Club which offers various activities and camps for children and families. This hidden secret offers great yearly traditional events such as the Boulevard of Dreams Car Show in June, and the Art on the Boulevard in August. There's several excellent eateries here in Erieau offering delicious meals such as Molly & OJ’s, The Sandbar, The Bayside Brewery and the Galley Pub. Couples can enjoy the sunsets on the pier surrounded by water of Lake Erie and Rondeau Bay or just take it easy and relax on the beach. Did you know that in Erieau, you’re able to use ATV’s on the roadways and on the various trails? Within minutes from Erieau, you can find yourself at one of Ontario's most beautiful Provincial Parks, Rondeau Park. Here you will fall in the love with the outdoors all over again. Explore the trails and enjoy hiking and biking, bird watching and the park wildlife. Check out the incredible 14 kms of sandy beaches at Rondeau Park, and see some of over 300 species of birds spotted yearly. Erieau has a unique charm that will keep you coming back year after year. While strolling down the boulevard you will have the chance to check out the local produce and boutiques. Wave hello to your friendly firefighters, or stop and have an ice cream and sit and admire the beauty of Lake Erie and see the smiles on peoples faces. The Village of Erieau has it all. All it needs now is for you to come out and experience this amazing part of Southwestern Ontario. Check out just some of our guest reviews! Such an amazing atmosphere and comfortable rooms. Second time we have stayed here for Labour Day weekend. Nice and clean. Will be back next year! Get social and connect with us! Erie-O Motel & Marina in Erieau Inc.
Don't miss out on our latest promotions and offers.